Jewels 4 God Inc. announces an unprecedented opportunity for women in the United States to join the fight against human trafficking while offsetting personal reductions in pay and job losses during the recession. Women can earn unlimited income while having the satisfaction of knowing that 100% of the net profit from their home show jewelry sales rescues women around the world from human trafficking. This announcement comes just three days after Secretary of State Hillary Rodham Clinton warned that human trafficking is flourishing in the shadows of the global economic downturn. Jewels 4 God Inc., a family operated in-home direct sales jewery company, announces an unprecedented opportunity for women in America to join the fight against human trafficking while earning part or full time income. This announcement comes just three days after U.S. Secretary of State Hillary Rodham Clinton warned that human trafficking is flourishing in the shadows of the global economic downturn. "Many women want to join the fight against human trafficking and drug addiction but simply don't know how. We started Jewels 4 God so women can have a practical way to get involved while being immediately financially rewarded for their efforts," said Tim Zello, who Co-Founded Jewels 4 God along with his wife Michelle. "In order to be fully empowered and become productive in society, women who are rescued need a restoration of dignity and self-esteem," he said. "Preventing women from returning to their old lifestyle requires teaching them the skills necessary to have a sustainable job and income, so vocational training and employment opportunities are key." Jewels 4 God International teaches marginalized women overseas how to hand craft beautiful sterling silver and semi-precious stone jewelry. In addition to job skills training, they also provide professional counseling services specializing in trauma and abuse. "Our training was held in India (2005) for women rescued from Falkland Road, the same area in Bombay where the cage scene was filmed in Slumdog Millionaire," Michelle said. "Last year we returned to India and trained a group of girls in Calcutta rescued from the red light district. One of the girls trained was Suchitra, now 20, from the Academy Award winning documentary Born Into Brothels." To date Jewels 4 God has trained in 11 nations - India, Pakistan, South Africa, Jamaica, El Salvador, Aruba, Serbia, Swaziland, Sri Lanka, Siberia-Russia, and Uzbekistan. "One of the greatest gifts you can give these women is the ability to support themselves," Zello said. "Our jewelry training, however, provides much more than economic benefits. It gives a sense of self-worth, an opportunity to express creativity, and it is therapeutic." The challenge that Jewels 4 God trainees face is the ability to sell their jewelry in countries where local economies are poor. In response, Jewels 4 God is offering the opportunity for women across America to earn unlimited income by selling jewelry "for God." Jewels 4 God Representatives earn 30% of all jewelry sales with no sales quotas to meet and have the satisfaction of knowing that 100% of the net profit empowers less fortunate women around the world. In addition, they can earn thousands of dollars in beautiful jewelry for free or purchase the jewelry at the deepest discount. Representatives can get started for as little as $150 which comes with $225 in free jewelry and everything needed to hold the first successful show. Jewels 4 God also offers a lifetime guarantee on the jewelry and generous hostess incentives. 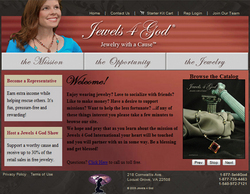 Women can join the Jewels 4 God team by signing up hassle free on-line at jewels4god.com. "It's a win-win situation for everybody," Zello announced, "Women get to earn extra income, free jewelry, etc. while helping other women and supporting a worthy cause. Others are empowered and rescued from their old life and Jewels 4 God fulfills its' mission. "While we applaud other in-home direct sales companies for giving a percentage of the sale of one of their products to support a worthy cause or charity, we founded Jewels 4 God, Inc. so that 100% of the net profit from the sales of our jewelry will empower more women." "Tying a woman's love of jewelry with teaching women vocational skills to help them support themselves and their families and giving more fortunate women the opportunity to get involved by selling jewelry is nothing more than genius," wrote Arlene Allen, Editor of Woman's Touch, an on-line magazine for women. Zello said, "One former addict told me, 'The opportunities for marginalized people to learn a skill to support themselves are very few. Often their cries for help are never heard and they die helpless and hopeless. To me, Jewels 4 God is a life preserver being thrown to them - practical help and a glimmer of hope! People in pain want to get out of pain, so many turn to drugs just like I did. What I wouldn't have done to have someone tell me there was a free place I could go to learn a trade so I could start a new life.'" Jewels 4 God is providing just that - skills and opportunities necessary for a new life, and the incredible opportunity for women in America to financially help themselves and their families during these rough economic times while helping others who are less fortunate around the world! For additional information on the news that is the subject of this release contact Tim Zello or visit jewels4god.com. Jewels 4 God, Inc., an in-home direct sales jewelry company, provides women with unlimited income potential along with satisfaction of knowing that 100% of the net profit from their sales supports the mission of Jewels 4 God International. Jewels 4 God International, a 501c3 non-profit organization, trains faith-based organizations involved in rescuing women how to make and market handcrafted jewelry to help them become sustainable and to provide viable job skills for the exploited, marginalized and disenfranchised women with whom they work assuring their successful re-integration into society, employability, and financial independence.